Past few days I've been very ill indeed, but I'm slowly on the mend. I've managed to come off two of the 4 mega painkillers, so I'm just dealing with two now. I'm still on a puree/very soft food diet, but I hope to be able to eat some normal food tomorrow. I have been far too sick to knit, unfortunately. So, I've been sat watching Lost! I don't sleep much, so I'm already on Season 3 ep 3, and you could say I am a little addicted. I love all the characters (except Ana Lucia, she was a pain! ), but my favourite has to be Jack. I found myself sobbing at 6am this morning as I watched Jack go through his divorce. Now, whether it was because I was emotionally unstable from being weaned off a load of medication, or it is because Matthew Fox is an awesome actor, I'm not sure. Probably both. But what it does mean is, I really need to start crafting again. So today, I did a couple of rows of the Seven Seas Blanket. I'm now onto a new colour, and what I've realised is this baby isn't going to be wide enough. I should have done two balls of each colour for the stripes instead of the one, I never realised it was going to be this wide! So, I'm thinking of adding more colours, but I'll have to talk to Mum again and see what she thinks. The yarn is King Cole Big Value DK in Pot Pourri (296), which Deramores no longers stocks unfortunately. It has a slight wooly feel to it despite being 100% acrylic, and knits up nicely. I would love to master the basics of crochet so I can move onto a 'proper' project, so I thought the best way to begin to learn, is by making a granny square blanket. I love granny squares. I love how they look, I love creating them, and I also love how quick they are to make! (I think my high score so far is crocheting one in 15 minutes). So today, after a few episodes of Lost, I had a dig through my stash box and bagged up most of my DK scraps (I have a few more looming near the bottom, but by the time I got there, the temptation to start making something was just too strong). Most of yarn in the scrap bag are remains from previous projects, some are skeins of yarn I hate (but I can never sell/throw yarn away, I have to make something with it), and the rest are tiny skeins of acrylic crap I got in magazines. I really want to use it all up, so I have more room in my stash, so I thought I would use these scraps for my crochet blanket endeavor. I made 5 of these granny squares today, which brings my square count up to: 7. I'm going to try and make one or two a day, and see how that goes. I've noticed that it is a brilliant way to test out colour combinations! I'd like to make no two squares the same, but I can't see that happening somehow. My Mum has said she'd happily sew them together for me in the evenings while she watches telly, and as you know I am rotten at sewing up so I quickly jumped at her offer. 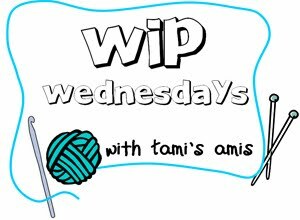 So that is all from me, before I send you packing to Tami's, just a little reminder that I have a giveaway going on my blog, so you should go check that out! OK, so like, totes off topic re: crafting, but I can't remember any of the characters in Lost lol! Except Jack and Hurley! I don't even think I watched the last season.